Let’s begin with a little mental field trip. In the mid-2000’s, MySpace and Facebook were battling it out for social media dominance. On the front lines of MySpace, users had the creative freedom to customize virtually every aspect of their pages – backgrounds, colors, fonts, etc. – which resulted in both glorious personal expression … and a whole lot of crazy. In the other camp, Facebook’s army of users adhered to its strict templates, generating a more polished and easier to use experience which ultimately helped it become the undisputed world leader in social networks. So if you want to create a world-dominating presentation…. I mean, a more sophisticated looking slide deck, the key is consistency. Keeping a diligent eye on your alignment, fonts and color palette will help take your PowerPoint to the next level. To ensure consistent fonts and alignment of titles and text throughout your deck, be sure to utilize the layout templates. In the Home tab, choose the Layout that works best for each of your slides. So just how important is alignment? It’s so important that PowerPoint offers not just one, but an array of tools to help you align objects to the slide and to each other, as well as guides to verify alignment from one slide to the next. Select one of the vertical or horizontal alignment options (Top, Left, Middle, etc). Note: “Align to Slide” is default when only one object is selected. Distribute Vertically to create even spacing across your select area or slide. Review alignment of text and objects across all slides. Note: The guides do not appear in Slide Show mode. Even when you stick to the templates, rogue fonts can be introduced when inserting text boxes or pasting elements from other presentations. Even very similar looking fonts can create visual disharmony, so get a little fussy. Click on text areas within imported elements to confirm the font style (typeface, size and formatting) matches the rest of your presentation. Take advantage of style options — bold, italic and/or uppercase — to emphasize your key points. Be sure to repeat this formatting style throughout your deck. Use color to create contrast. Either change the color of the text itself, or add a colorful backdrop shape to create a visual element. If you want to add a second font to the mix, choose the serif/sans opposite of your first font. Serif and sans fonts are easily distinguishable from each other and work together in visual harmony. A second font can be well used in subheads, captions, sidebars, etc. A very quick and easy way to liven up those text-only slides is to turn them into boxed lists, flow charts and more using PowerPoint’s SmartArt tool. Easy editing: Change colors and fonts to match your presentation style. Add or edit text within the graphic. It is likely your company’s brand guidelines will influence the color choices for your presentation. Whether you have some flexibility or total freedom in color selection, think of your color palette as a party. A party of one is no fun. A party of two makes leads to clear communication and deep connection. A party of three adds diversity and richness to the conversation. A party of four or more can quickly feel chaotic, particularly if more than one participant is loud. Keep it by invitation only: stick to your chosen color set throughout the deck. 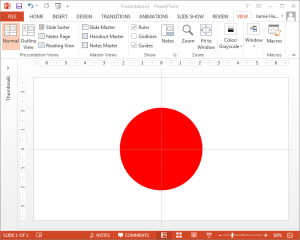 As a last resort, you can select one of PowerPoint’s palette options in the Design tab. Just keep in mind that Microsoft is not known for its amazing design choices.